"I just wanted to tell you how pleased I am with the two crosses that I purchased from you. They are beautiful and your price is reasonable. I will order from you again in the future." 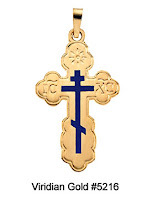 Olga T.
She had ordered two crosses, one of the yellow gold St. Olga Orthodox Crosses with Enamel Inlay, #5216, and the sterling silver Enameled St. Olga Orthodox Crosses with Chain, #5217. We are glad she liked those, because we quit carrying another similar type of the St. Olga cross, because although it was less expensive, it was too thin, and felt "cheap". That's just another example of why we are so selective in the items we carry in our store!